The most recent stripe rust update from Dr. Xianming Chen, ARS Plant Pathologist, came out Saturday in the June 16, 2018 forecast. Since my last update in May, most winter wheat fields are past the flowering stage and stripe rust remains at a relatively low incidence. Spring wheat, however, is nearing or already begun flowering in most areas and it remains important to continue scouting for stripe rust. Although rust incidence has remained relatively low this season, the recent cool and moist weather provides conditions that are favorable for infection and disease could develop quickly over the next few weeks. As such, continued scouting of fields that are pre-flowering is recommended and a fungicide application should be considered when 5-10% rust incidence or severity is found. Susceptible varieties rated 5 to 9 in the Seed Buyer’s Guide will likely need a fungicide application, especially if one has not been made already, but resistant varieties rated 1 to 3 should not need a fungicide application. In general, fungicide application after flowering provides less return than those made before flowering, and many fungicides cannot be applied after flowering according to the label. However, there are a few fungicides that can be applied with a 30-day pre-harvest interval; make sure to read the label if a post-flowering fungicide application is made. This likely will be the last stripe rust update of this crop season. Additional information on stripe rust, including photos showing rust percentages and a table listing fungicides with their active ingredients, use rates, and growth stage restrictions under the Foliar Fungal Diseases in the Disease Resources section of the WSU Wheat and Small Grains website. Figure 1. Partially blighted wheat heads due to Fusarium Head Blight. Figure 2. Fusarium head blight under field conditions. Figure 3. Field conditions of Fusarium head blight. Fusarium head blight (FHB), also known as scab, has been reported in irrigated wheat fields in the Columbia Basin. 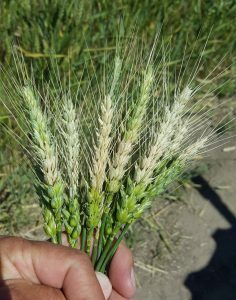 FHB, which also affects barley, is not a new disease to eastern Washington. 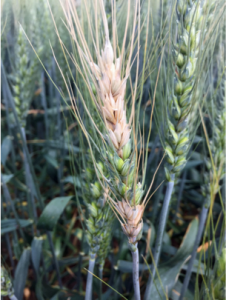 In fact, FHB is a worldwide problem for wheat and barley production, especially in areas with summer rainfall and warm temperatures (see Return of an Old Problem: Fusarium Head Blight of Small Grains). FHB is not usually a concern in eastern Washington, however, reports suggest that the disease is becoming more common and increasing in severity. Symptoms of FHB include completely or partially blighted heads (see photos) due to infection of individual flowers (florets). Several other diseases can cause whiteheads in which the entire stem and head is blighted; however, FHB can be distinguished from them because the stem remains green and only the head is blighted. Under moist conditions, infected flowers and kernels may develop a pinkish color, and kernels become shrunken and shriveled. A distinct line of the pinkish to salmon-orange colored spores are frequently found first along the joint line between the floret and stem. Shriveled kernels can be covered with a white to pinkish fungal growth, and are called tombstone kernels. Later in the season, small, dark-colored fruiting bodies of the pathogen may develop on infected heads. These fruiting bodies contain spores that are spread by wind over long distances. Concern over FHB is due to direct yield losses associated with the disease and mycotoxins produced in infected grain by the pathogen. Early infection of flowers often prevents kernel formation, whereas later infection results in shriveled kernels. The main toxin produced is deoxynivalenol (DON) and commonly referred to as “vomitoxin” due to its effect on animals that consume infested grain. There are several different fungi in the genus Fusarium that can cause FHB. These same fungi also cause root and stalk rot of corn, and increasing corn acreage in the Columbia Basin is likely one explanation for the increase in FHB. The FHB fungi survive in corn residue and produce fruiting bodies in the spring that release airborne spores, which can travel long distances and infect wheat plants at flowering and barley after head emergence. Consequently, corn does not have to be part of the rotation in the same field for FHB to be a problem. Management of FHB includes planting resistant varieties, irrigation management (reduced or no irrigation for a week after flowering), and foliar fungicide applied near heading. (Use only triazole fungicides because strobilurins, whether applied alone or mixed with triazoles, may result in increased DON in seed) It is very important to increase the fan speed on the combine at harvest in those fields with FHB to reduce the percentage of kernels with low test weight and high DON. 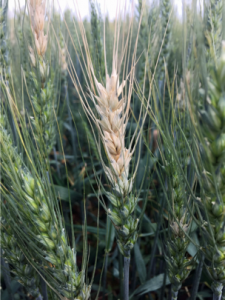 More information on FHB can be found on the American Phytopathological Society website (Fusarium head blight (FHB) or scab), the University of Idaho Cereals Extension (see Fusarium Head Blight webinar on the front page), and Montana State University extension bulletin. For questions or comments contact Tim Murray by email (tim.murray@wsu.edu), by phone (509) 335-7515, or Twitter (@WSUWheatDoc).